Welcome back! 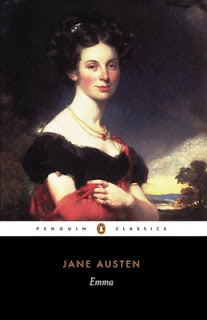 In March, the members of Operation Awesome read EMMA, by Jane Austen. Emma is a classic, by a revered author. So why did some of us have trouble finishing? Read on, and please add your thoughts in the comments! I have struggled with reading "classics" all my life. While a part of me would love to be "well-read," the actual reading of most of those books has been onerous. I often can't read them unless I've seen the movie (Pride and Prejudice is one that comes to mind). Well, I've seen Clueless, so I figured that would be enough to get me through EMMA. And it helped; I kept reminding myself "Okay, Harriet is Tai, Mr. Knightley is Paul Rudd's character..." While I was able to keep the characters straight, I still kept falling asleep while reading! I do intend to finish EMMA, someday, but alas I could not finish it in March. It's not like I didn't have free time this month; the amount of Gilmore Girls I watched can attest to that. But when the choice came down to watching Netflix, working on my own book, or reading EMMA, somehow EMMA always got picked last. In fact, I only read it when I was donating plasma and the internet wasn't working (meaning no Netflix). I tried to pinpoint what it was about EMMA that kept putting me to sleep, and I think it's the pacing. It moves soooooo sloooooooowly. Most of the beginning of the book is dialogue or exposition. Emma's governess/companion moves out, but we're mostly told that, not shown it. Harriet becomes Emma's friend. And then the Travis-equivalent proposes to Harriet (that's as far as I got). But somehow there is endless talking about FREAKING EVERYTHING even though barely anything is happening! It reminded me that while dialogue often helps us get to know characters and love them, it is not a good device for advancing a story. Action is important. Stuff has to happen on the page, not just be talked about. I'll finish this one, eventually, if the internet isn't back on at BioLife. At least it was free! Honesty time: I did not complete the homework assignment. I DNFed this book at 7%. And what's more... I was the one who picked this out. I spent most of my life avoiding Jane Austen. Her writing isn't exactly my thing. I'm more into space operas, gritty fantasy, and psychological thrillers. That's about as far from her prim romantic interludes that you can get. My BFFs in high school were obsessed with the Gwyneth Paltrow movie, yet I never read any Austen works until a couple years ago. However, I enjoyed Pride and Prejudice. It's quaint. I liked the voice, and I can understand why people go crazy over her writing. I've also been bingeing Downton Abbey on Netflix lately, so I get it. I get it. I GET IT. What I didn't get was who all these people in Emma were. OMG, so many people. And her father went by "Mr." or whatever? Like, how am I supposed to remember that? I spent half the second chapter thinking I'd been introduced to someone new and being confused about someone's second cousin's childless marriage and... Yeah. March has been a stressful month for me overall. I might have persevered longer if I had more energy. I really thought I'd like it, but that's the verdict: DNF, 7%. Sorry, Ms. Austen. I have to confess that the only reason I read this book is because a good friend of mine told me it was a digestible Jane Austen. I had a history of DNFing all the Jane Austen books because, oh my goodness, they dragged. And dragged. This one was a bit more readable for me though. Perhaps it's because I'm older, reading more, writing more, and I have a different relationship to words than I used to. It probably also helped that I saw the movie Clueless first, which made it easier to keep track of everyone, especially with a double-check to the wiki. But I definitely agree with Samantha that it was chock full of people. Emma is a beautifully complex character, so much so that I still rooted for her despite her frivolity and stubbornness. She's smart and clueless at the same time, all while being so wonderfully interesting. Something very difficult for a writer to pull off well. As much as I liked the book, however, it is, as of this post, still a DNF. I'm more than halfway through, and intend to finish. And I'll definitely be watching Clueless again. I am a sucker for Jane Austen's dry humor and spot-on characterization of people who seem too real to be made up. Frank Churchill, for instance, while charming in every movie adaption of Emma I ever saw, is really quite a cad in the book. Take this excerpt, from when Emma catches him staring at his secret fiance. He started. "Thank you for rousing me," he replied. "I believe I have been very rude; but really Miss Fairfax has done her hair in so odd a way--so very odd a way--that I cannot keep my eyes from her. I never saw anything so outre! Those curls! This must be a fancy of her own. I see nobody else looking like her. I must go and ask her whether it is an Irish fashion. Shall I? Yes, I will--I declare I will; and you shall see how she takes it--whether she colours." Not quite the charmer Ewan McGregor had me crushing on! As much as I have loved the characters in Pride and Prejudice, and Persuasion, I believe Emma holds some of the most ridiculous and yet life-like of any Jane Austen wrote. While the story line may drag a tad, the actual conversations are so much fun, you couldn't get any more entertainment from watching The Bachelorette, which is, of course, how Emma likes to describe herself. I'm a big fan of Jane Austen's work, and of all of them, I love Emma the most, and not just because I think Mr. Knightly is the best Austen love interest. The characters in this book are people you can identify the world today: Emma, who means well and says things that sound correct but doesn't realize how unnecessary her advice and "assistance" really is; Harriet, who values her friend's opinions over her own, much to her detriment; Mr. Woodhouse, who's content in his comfortable little world of consistency and hates any kind of change; and the rest of the cast, whose blunders and antics and interactions are so relatable, even so many years later. Yes, the plot isn't exactly action-filled, but with Austen, I'm in it for the characters, the clever dialogue, and the little hidden gems of understanding, rather than a riveting plot. 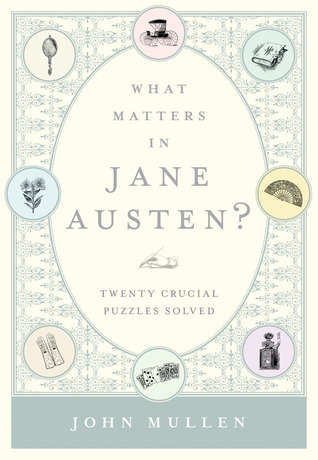 On the topic of "hidden gems" -- for fans of Austen, or those who may have read the works but feel like they're still missing the "inside jokes," I'd definitely recommend What Matters in Jane Austen: Twenty Crucial Puzzles Solved by John Mullan. This literary criticism outlines twenty insights into Austen's world that make reading these novels even more enjoyable and might make some of those tough-to-get-through chapters make more sense. It contains insights on what those books were that Harriet told Mr. Martin to read, why Austen had her characters play those particular card games, and how much the age difference between characters would have really mattered during those times. You may be surprised what you've been missing! 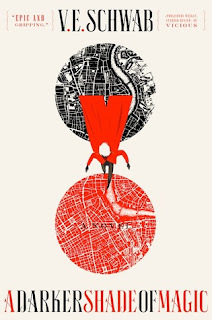 In April, we're reading A DARKER SHADE OF MAGIC, by V.E. Schwab. Come back on Monday, May 2, to discuss what you thought of the book! 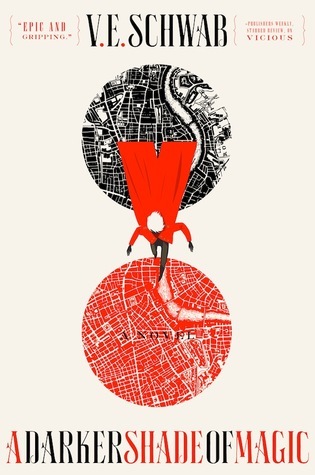 Click to Tweet: I'm reading A DARKER SHADE OF MAGIC by @veschwab in April for @OpAwesome6's #OABookClub. Join me? Quick update: As I mentioned above, I've had a hard month. My father-in-law died on Good Friday. Before that, my husband went up to see him in his final days, and I had the week off from work to (supposedly) potty train our toddler. But Morrigan was very upset that Daddy was gone, so that didn't happen. No potty training with depressed toddlers. Then hubby got home, and his father went into palliative care, and we took the twelve hour drive up there. As I'm writing this, we're on the road back home. So that's more of a life update than a Les Miserables reading update, but all that to say: I'm behind, but not because I'm not enjoying it. My big overall thought on the novel is, "Poor Cosette. Poor Fatine. Poor Jean Valjean. Poor everyone." But then, with a title like that, what do you expect? Hopefully I'll be caught up by next month! Thanks for stopping by. Let us know what you thought of Emma in the comments! Now, I do agree with you, Wendy: The characters are excellent. No problems there for me. Did you know you can shorten your long links with AdFly and make money for every click on your shortened links. Teeth Night Guard is offering precise fitting and highest quality custom made teeth guards.